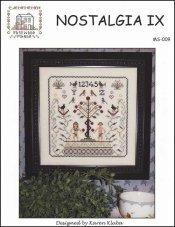 Nostalgia 9 [C6846] - $8.00 : Yarn Tree, Your wholesale source for cross stitch supplies. Inspired by antique sampler motifs. This is the ninth design in a series of twelve smaller samplers that can be stitched together to form one larger sampler or stitched individually. Stitch count for individual design 109 x 109. Stitched on #2021 Cashel Linen Cream.